Brian Graham is the winemaker behind the Ramian Estate, Canard, and Parlay labels. Extroverted and boisterous, Brian's not a guy you easily forget meeting. The magic he has extracted from the Canard Estate fruit is well documented on this site and his Ramian bottlings have an ardent following. Parlay is a venture into the more approachable end of the price spectrum. But just because the wine is more modestly priced than his other labels doesn't mean that it isn't what you'd expect from a guy like Brian: full tilt. On the surface, this is a fun little wine, but that changes quickly after sip number two. While of medium body and density, the flavor structure of this wine runs deep; soft, round, precious. Layers of baritone, meandering fruit take you on a journey that swirls along a languid, comforting path to contentment. Versatile as a contemplative wine, social accompaniment, or with all manner of foods, this is something of a Swiss Army Knife wine - only draped in crushed velvet and sitting in a well worn mitt leather chair. Wow. If it had a smidgen more density or heft or tannins - and was labeled as being from Napa (70% of it is), it'd probably be triple the price, but probably no more enjoyable. 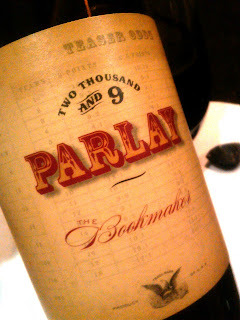 A stellar wine at a fair price. I'm in Canada . How do I buy this wine ? Who will ship it to me here? I have been looking for this for several months and called several places that Carry it but won't ship to Canada. Somebody please help me get this !! Parlay ! Hi Anonymous - Wish I could help you, but Canada's liquor laws are a mystery to me - and the international shipping laws are even worse. Your best bet might be to have someone (a friend or family member) in the US ship you some. Alternatively, you could reach out to Natalie Maclean (www.nataliemaclean.com/) to see if she has more north-of-the-broder knowledge. Good luck! where in canada are you, close to buffalo possibly?